Imagine the world without headphones! You can only listen to music on a speaker system or in a concert hall. Life will be boring! Yes, we know they do have their limitations but have survived a long time. Earphones have changed over the years, and they look and sound different to the ones you bought yesteryear. The headsets are fancier with a touch of class ranging from Bluetooth, Hi-Res Audio Playback, to Noise-cancellation. With that said, it is our task to hook you up with the best headsets in every style, and price point available. Over the years, we have listed hundreds of earphones of every model from the best wireless headphones to best noise-canceling headsets and earbuds. We recommend you look at the brands, and models available, but if you do not have the time, the best place to start is with our wireless headphone review here. What Makes The Best Wireless Headphone? To answer the question all depends on your listening needs, as there are different styles available. You can get in-ear, on-ear, around-ear, wired, and wireless. Further, you get other exciting features to give you the best listening experience no matter where you are. Therefore, if you are uncertain about which headset to buy, stay a while longer and read on! When it comes to choosing a pair of headphones, it all depends on how you plan to use it. You may want a headset for your home theater system, gaming, or using on the go. Here are some designs and style you might want to consider with your next purchase. You can find them in disposable models on a plane or even get them included with your phone. Alternatively, you can find high-performance buds with outstanding sound. The earpiece is tiny, and you insert it into your ear canal. Some of them come with wings or fins for a secure fit. The earbud has a lightweight and compact construction, and some have a microphone with controls. The earpiece offers little interference if you wear hats, glasses, earrings and more. The biggest problem is the bass response as it often does not sound great and can cause discomfort when used for a long time. Some are difficult to insert or remove and not ideal to use in an office environment as the wires become tangled. However, you do get added features to control the volume, different sizes & designed ear tips, multiple armature drivers and more. You can find these headphones in inexpensive to high-end design and rest on top of the outer ear. While you do get them with a closed structure, some have a fully sealed design to increase noise isolation. Further, the earpad earphones are more suitable for office use as one can still hear the sound from your surroundings. The items compact and you do not overheat compared to using a full-size headphone and some fold up for transporting. The downside is they do not provide you with complete noise isolation, and the bass is less compelling. You can buy them with navigation controls and a microphone included for hands-free use. Furthermore, you can get them with a coiled or straight cord. These headphones have earcups that enclose the ears and offer you the best acoustic isolation. The device is better for home use and provides you with noise canceling and so much more. You get the best bass, and loudness levels as the earcups give a large sound stage with surround sound and seal the music in and block noise out. The headset is large and not portable to take anywhere and causes overheating in the ear area. Some of the headbands come in the way if you wear glasses or earrings. You can find them with a microphone, detachable cord, navigation buttons, replaceable pads, and more. 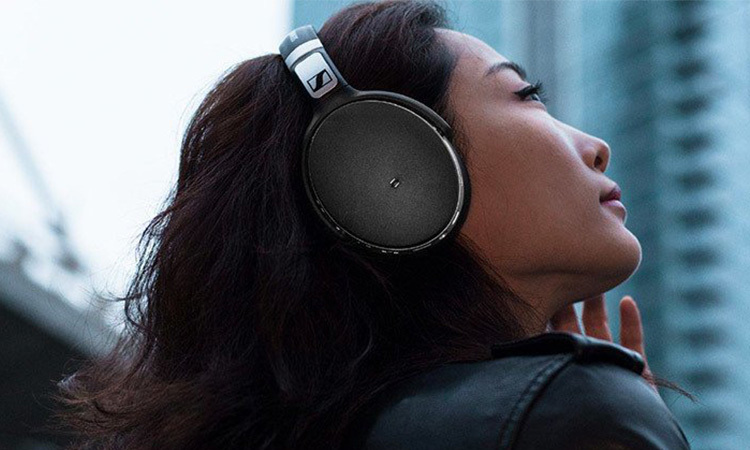 Now we come to our favorite wireless headphones to transmit music without the annoying wires getting in the way. The main problem is you will have to sacrifice sound because of the file compression development. The best options to look for a pair with aptX Bluetooth codec that helps improve the reliability of the music. Further, you can find them with RF connectivity to use with your home theater system or Wi-Fi ones. No wires are getting in the way, and you can stream music for up to 33 feet away. The most significant forewarning is it stops working when the battery dies, and your music sounds less dynamic with the compressed audio files. 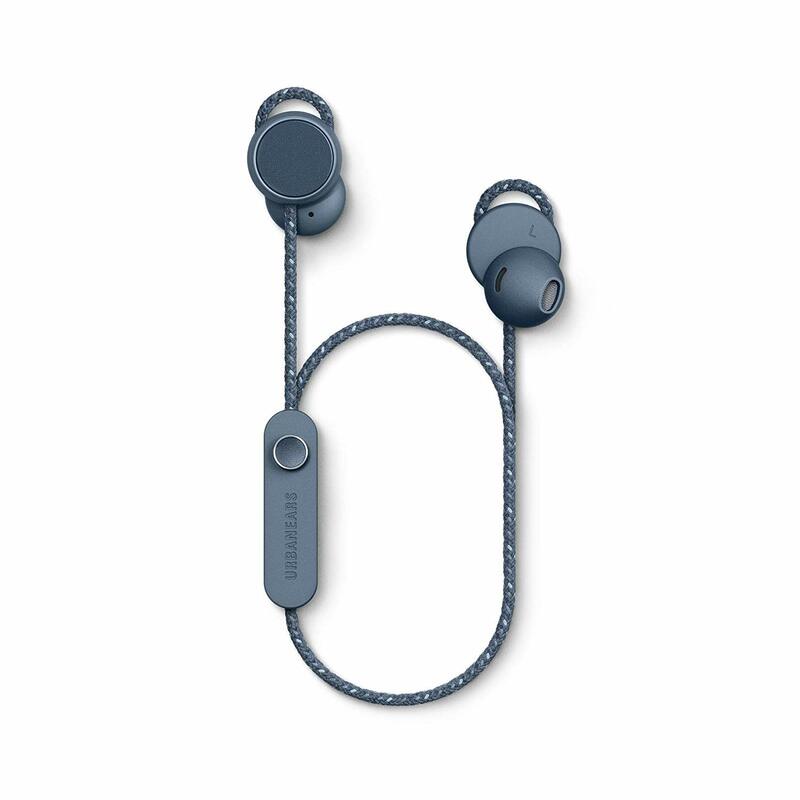 Other extras available are active noise-cancellation, cables included for hardwired connection, travel case, 3.5mm port, and replaceable earpads. Other earphones that also make part of the range are the complete wireless ones that consist of two spate wireless buds. Some even have built-in heart rate sensors with on-ear touch navigation and noise filtering. The headphones you can purchase in all forms and sizes and helps keep out background noise. 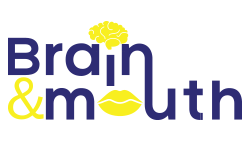 You can use them to listen at lower levels and prevents you from getting tired. The music is more low-level detailed and helps eliminate ambient noise. They are ideal for traveling by public transport, but some users have found they get motion sickness when wearing them. Are you ready to buy the best wireless headphones? Then size, technology, and the type of earphones are essential features to consider. However, other characteristics are just as crucial to look at. Closed versus Open – with sealed headphones, you get noise-isolation and commonly found in in-ear models. However, you need to remember that the degree of isolation fluctuates from one brand to another. Do you travel a lot? The closed model is perfect for commuting, as it does not allow the sound to seep through to others. While the open design does not block out noise, it is highly recommended for outdoor use. Comfort – the best way to test the weight and support is by putting them on as choosing and enclosed one can become uncomfortable after a while. Some headsets are bulky while others have a lighter headband making it comfortable to wear for hours. Build Quality – durability is essential especially when you buy an expensive pair of wireless headphones. You do not want it breaking after a week of continuous use. If you pick a foldable design, make sure the hinges are robust to not fall apart after two months. Wires – depending on the headphone you buy, check the cable dressing and the length of the cables included. Further, decide where you plan to wear them, as you do not want to go jogging to find the wires get in your way. What are the best wireless headphones to buy? For the best budget in-ear, wireless headphones with great sound and incredibly cheap, look at the Hussar Magicbuds. The device has a quality build with a balanced and rich audio and narrow soundstage. They are ideal if you tend to break or lose your earphones, as the price is affordable. There is a slight mid-bass bump and slightly emphasized but not too much. Further, it features a good impact and still maintains excellent control. The highs can be sibilant at times and make your music sound more exciting. The Bluetooth earphones are comfortable to wear when you hit the gym, do yoga, or sit and listen to music at home. Hussar has increased the battery use for up to nine hours and optimized the circuit design making it reliable with improved performance. The exterior has IPX7 nano-coating to make it moist resistant for any form of sports activity. Additionally, you can add bonus items as the memory-foam ear tips, EVA case, and aluminum-climbing hook. 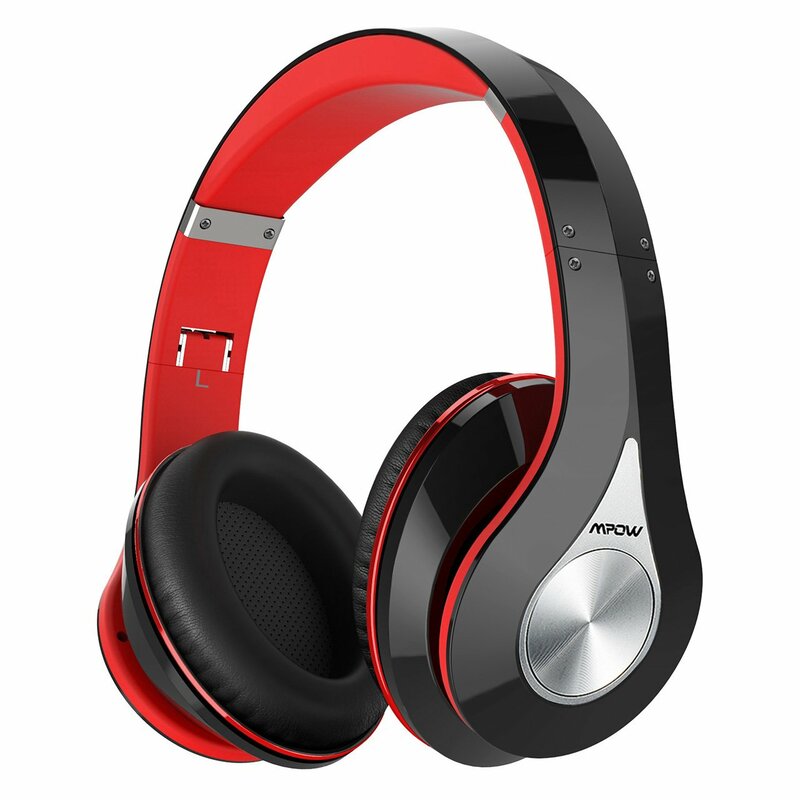 The Mpow wireless headphone has an over-ear design with passive noise isolation and does not cancel out sound completely. With the closed-back construction, you get an immersive Hi-Fi sound. The headsets equipped with a CSR chip and 40mm driver. Mpow has designed the ear cushions with memory-protein to give you lasting comfort. The stainless steel slider with padded headband does not constraint your head when used for hours. You can use it wired or wireless and provides up to 20-hours playtime in a single charge. Alternatively, you can use it with the provided audio cable and will not power off. For transport, you can fold them up and place it in the bag or your top drawer of the desk. Depending on your head shape and size, the headphones may be a bit tight as it has a structure to prevent sound leakage. Further, you get a 45-day money back guarantee with an 18-month warranty included. You can quickly connect it to different devices that are Bluetooth V4.0 enabled and offered up to a 33-feet range. You can use it with your TV but may need a separate adapter to connect it. With the Mpow Flame, you can bring your music with you to the gym. 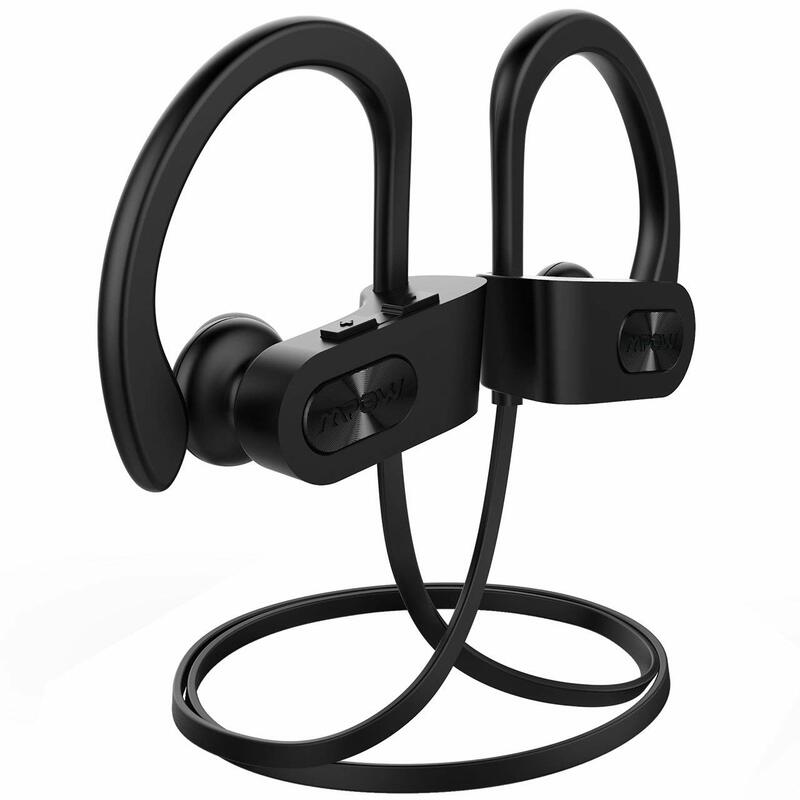 The product has an IPX7 sweat proof rating and fits into the ear. You get true high definition sound with rock-solid bass to enjoy your favorite tunes on the go. The in-ear design is shallow and comes with silicone ear hooks with memory-foam ear tips for comfort. The Bluetooth headphones are always ready to go where you go with the carry pouch and cord clip. The EVA bags cushioned to keep the item safe while the cord clip holds the wire around the back of your neck or head. To top it all, you get an 18-month warranty included. The standard connection is Bluetooth V4.1 and works as a headset, A2DP, AVRCP, and hands-free profiles. The operating range is 33-feet with a standby time of 220-hours. The 100mAh battery offers you up to seven hours playing time. 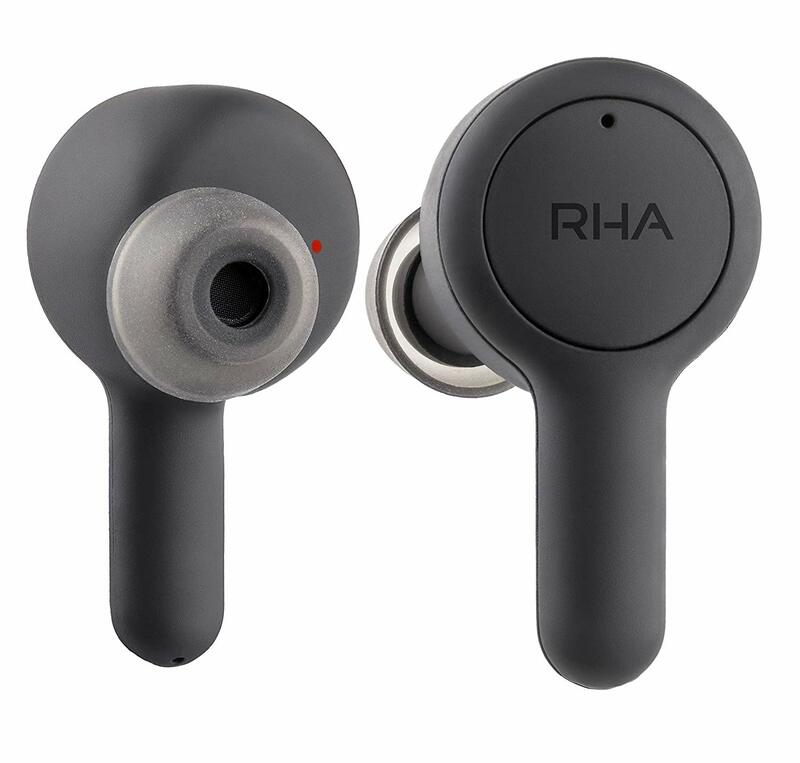 For one of the best earbuds at an affordable price range, the RHA MA390 has an excellent build with dynamic sound. You get great value, but it is not ideal to use for exercise. The wireless headphones impressive with fun sound signature and can withstand a beating. The earphones have a closed acoustic design and weigh 18 grams with a frequency response of 20Hz-20 kHz — the headsets equipped with 6mm dynamic drivers with a sensitivity of 92dB+/-3dB. The impedance is 32 Ohms, and the wireless range is 97-feet with a battery life of eight hours. Furthermore, it does not have NFC and comes with enhanced Bluetooth connection with aptX codec to compress the size of the audio files you use. The device has a silicone neckband that is flexible offering you freedom to move. When not in use you can wrap the band and keep it stored in your pocket. With the Jakan Bluetooth headphones, you can enjoy up to 12-hours of wireless playtime. With the minimal earbud fit, you can answer calls and listen to music. 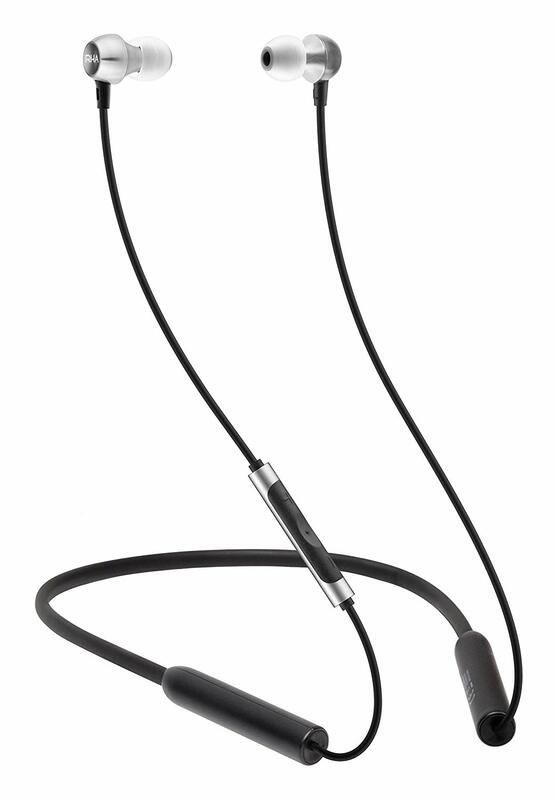 The fit is adjustable and comes with a control knob with magnetic earbuds to wear comfortably around the neck. When not in use you can touch the earbuds together to fasten around your neck. The device you can buy in different colors to fit in with your lifestyle. While the Jakan looks amazing not everyone may like the design. The earbuds are a bit hard in the ear, while some users found no problem with the pod-like structure. Unfortunately, consumers were not too pleased with the sound and seemed muffled but not bad. We recommend you make sure your earpiece lines up with the ear canal to improve the tone. The headset is perfect for video chatting and does not block out outside noise. What makes the Jakan unique is that you can use it to play video games, all you need to remember is each direction available on the remote. 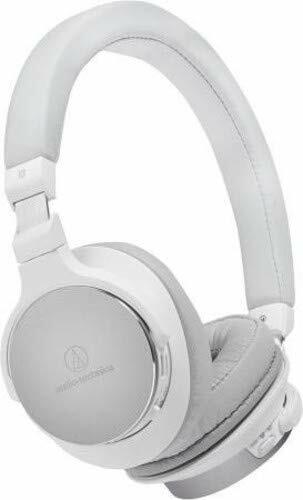 With the on-ear high-resolution audio headphones from Audio-Technica, you get a unique sound. You can hook up it up with up to eight different devices. Furthermore, it has Near Field Communication and compatible with NFC devices to automatically pair with your phone or other devices. The headsets equipped with 45mm drivers, a mic, and volume/control switch for hands-free use. Included you also get the 3.9-feet Smartphone cable with microphone and controls to use as a standard wired headphone. The polymer battery has a playtime for up to 38-hours and charges with the included 3.3-feet USB charging cable. You can pick your preferred color from black or white to fit in with your lifestyle needs as well. The microphone with control switch you find in the earcup for convenience and have a LED indicator to display the pairing status. The earcups made of soft memory foam and the headband adjusts for a perfect fit. 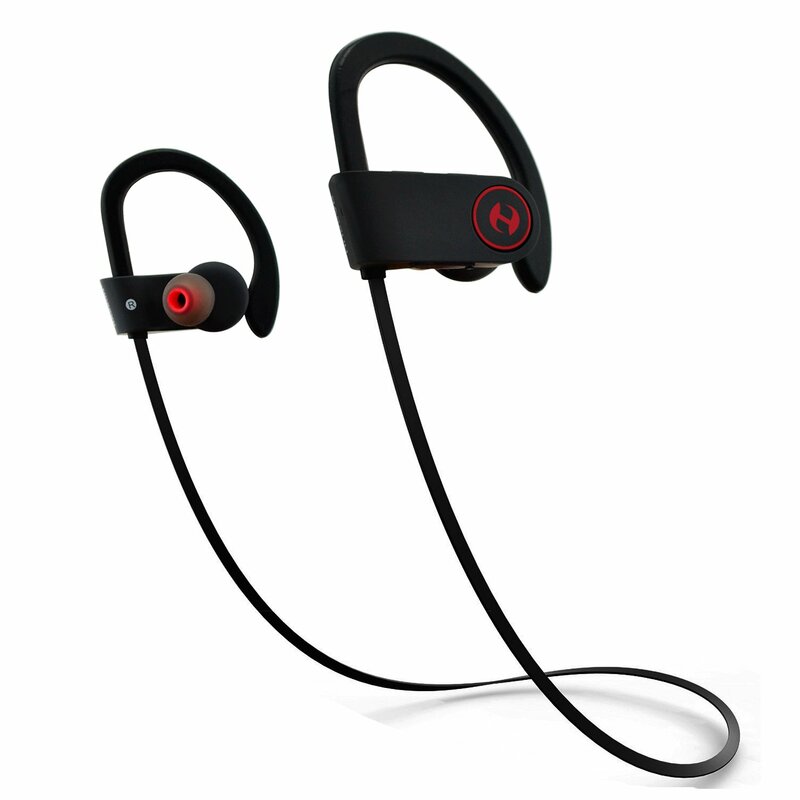 The Bluetooth headphones have a quality build, sound, and are lightweight on the ears. For comfort, the earpads soft but does not wrap around the whole ear and blocks out the noise to a certain extent. Therefore, if you want a pair of wireless headphones to use with or without cables, these are the best Bluetooth headphones you can buy. Do you want true wireless buds that are better than using AirPods? You can look at the RHA TrueConnect with a subtle and stylish Bluetooth design. There is no neckband or wires present, and you remain in full control with the tap controls on the earbuds. You can use it with Siri, Google, and Alexa. The earbuds designed to fit comfortable and secure inside the ear and comes with a variety of ear tips for a perfect fit. The device is sweat and water resistant making them durable to wear for any activity. The comply-foam ear tips provide noise isolation to reduce background noise. The pods connect to the most device using Bluetooth Version 5 connection and the battery offers up to 5 hours of playtime with 20-hours standby time. The earbuds charge fast with the charging case and come with a three-year warranty included. The sound quality is WOW, clean, balanced, and offers plenty of basses. Even the case included has a premium look to keep them safe. The device has a reliable connection whether your phone is in a bag or your pocket. 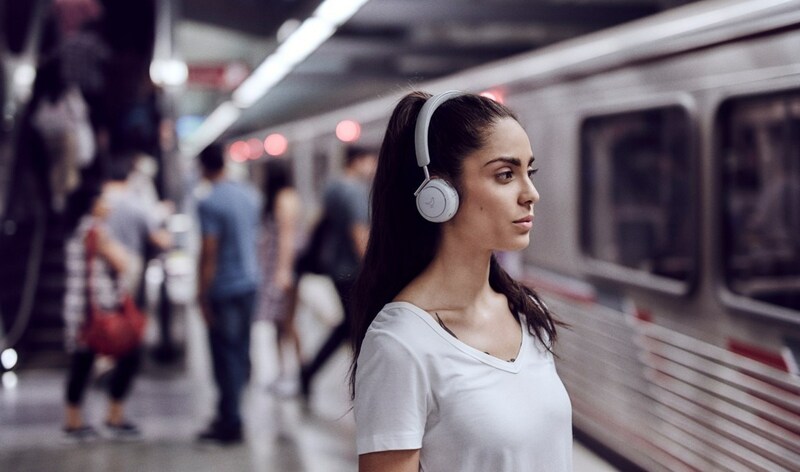 These Bluetooth headphones are a traveler’s best friend as it has an incredible 24-hour battery life with multi-point wireless connection. The styling may not suit everyone, but it provides a pleasant sound and automatically switches off when you are not wearing it. No matter where you wear the headset you can enjoy an immersive and high-res sound with the powerful speaker drivers. 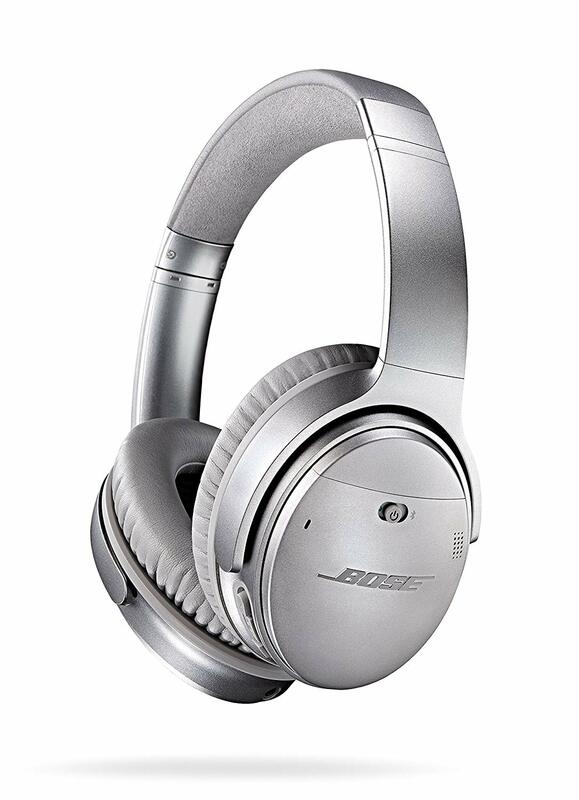 Switch on the active noise canceling to block out ambient noise when working or traveling. With wireless freedom, you can listen to audio up to 330-feet away and connects with Class 1 Bluetooth smart devices. The earcups swivel flat to place in the included protective case for traveling. Alternatively, you get instant NFC pairing to connect with more than one device simultaneously. Furthermore, you get an open listening mode to hear the surroundings when needed. You can even keep track of the battery level audible or visual by tapping the right ear cup, and a voice informs you where the battery life is standing. The earcups have memory foam padding and are comfortable to wear for hours without leaving the ears warm. You can use the device wirelessly or with the detachable cable and automatically pause media once, you put them down. Alternatively, you get full playback controls to place calls on speakerphone and more. Therefore, if you need, headphones that are not super expensive consider buying these. With this headphone, you can do everything and offers excellent noise cancellation with sound. You can stream audio for up to 30-hours, but the call quality is mediocre. With the digital noise canceling you can hear every note, word, and tune clear. Furthermore, the extra microphones isolate sound while you talk improving your phone call. The equipped 40mm Liquid Crystal Polymer drivers are Hi-Res compatible producing a full range frequency up to 40 kHz. The earcups and headband have a comfortable and slim profile for wearing hours. The earcups swivel and fold for transport and come with a travel case to keep them safe. The quick charge battery takes up to 10 minutes, offers you up to 5-hours playback, and comes with touch control and ambient sound mode. To add to the fantastic features, it has Alexa built-in offering you voice assistance when working or active at the gym. 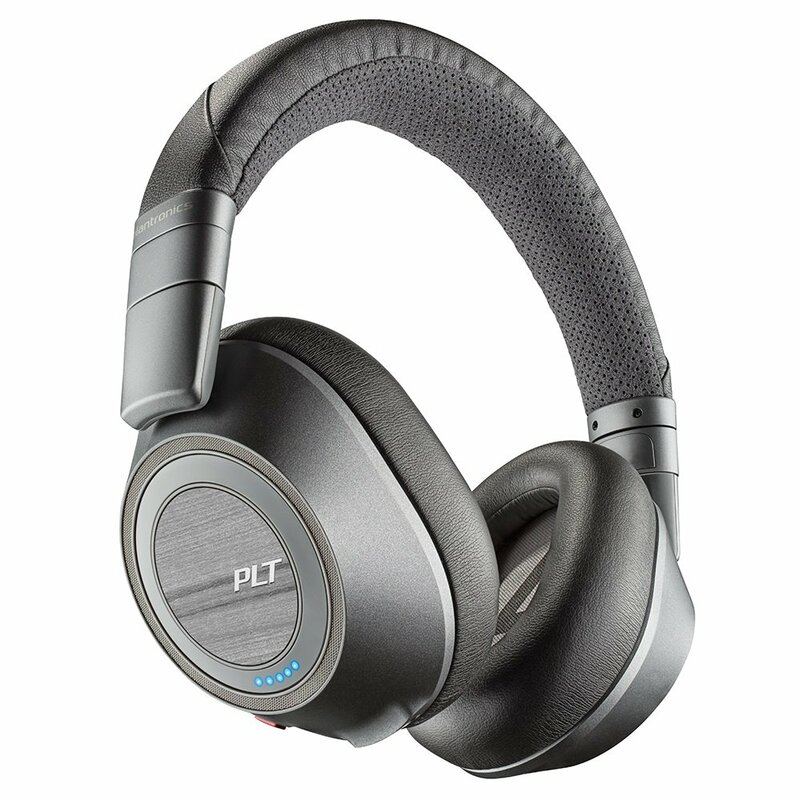 Therefore, if you want the best active noise canceling headphones with a comfortable design, you will not be disappointed with these. The Bose QC 35 II is one of the best noise-canceling earphones with the wireless design you can buy now. 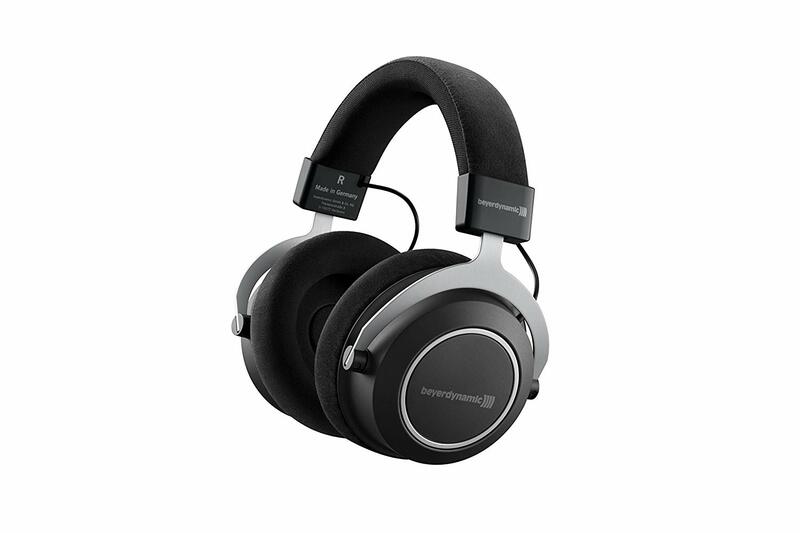 You get class-leading noise cancellation with a comfortable design to wear anywhere for hours. There is no instant mute, and some users mentioned the design looks plain. The device has a closed acoustic structure and weighs 23 grams with a battery life use of up to 10 hours. The wireless range is 33 feet, and it has NFC for pairing more than one device at the same time. There is a volume-optimized EQ for the best audio performance. Further, it comes with a noise-rejecting microphone, and you can use it wired with the included cable. You can use the Bose Connect app to make your audio more personalized. Alternatively, you also get the USB charging cable, airline adapter, backup audio cable, and a carry case. 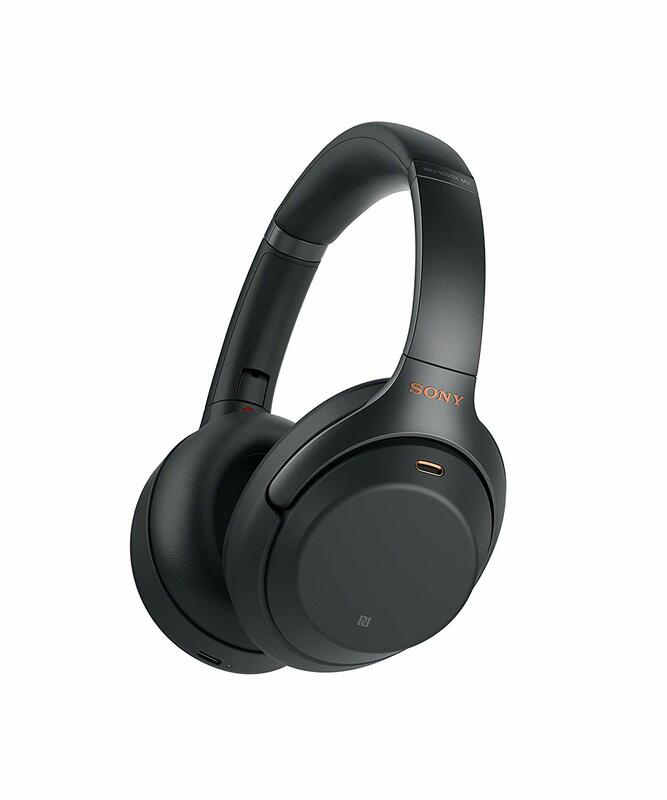 While the top 10 best wireless headphones on the list provide you with affordable, durable, and fantastic sound, you can also consider the following models that are a bit more expensive to buy. For the best-sounding wireless headphones, you can look at the Beyerdynamic Amiron model. The earphones have a closed design and weigh 380 grams. The build quality is excellent and offers you comfort for hours of use. The sound is detailed, dynamic, and spacious. You can use it wireless or wired, and both sound great, but it is not ideal for traveling. The detachable cable measures 1.2m and the frequency response is up to 40 kHz. Furthermore, it is equipped with Dynamic Tesla 50mm drivers with an impedance of 32 ohms. The battery provides up to 30-hours of use with a range of 30-feet. The headset does not come with NFC. 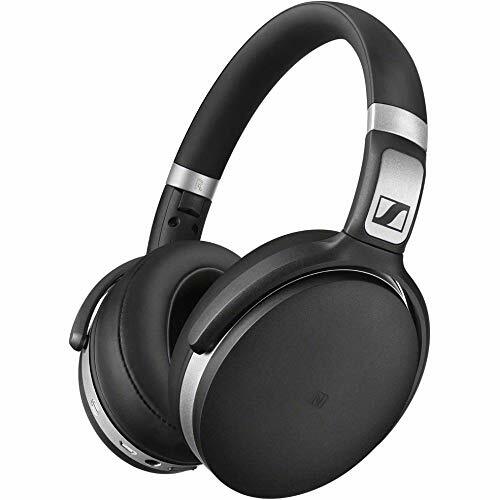 Next, we have the Sennheiser HD transmitter headphones with active noise canceling. You can connect to your devices using the Bluetooth 4 and aptX technologies. On the ear cups, you have the controls for controlling music and making calls with the included microphone. The microphone frequency response is up to 10 kHz, and the battery last up to 20-hours with the NoiseGard and Bluetooth enabled. You can use it with connecting cable for wired listening, and it comes with a two-year warranty. Furthermore, you can pair it with more than one device at the same time. The earpads covered with soft leatherette, swivels, and folds away for storage in the protective case. Which Wireless Headphones Do You Like? If it was the year 2010, we might have dissuaded you to buy a pair of Bluetooth headphones. At the time, there were issues with technology when it came to the wireless connectivity and sound. Further, the batteries did not last long and lasted up to two hours at the most. Thankfully, this is outdated, and the golden era of Transmitter Earphones is here. Thanks to aptX and the latest Bluetooth connections, you can stay connected, and the sound is fantastic. They do cost more than the wired ones but offer you the freedom of movement and perfect for a trip. Alternatively, they make a great companion paired with your phone. If you want to upgrade your headset, we hope you find a perfect pick on our best wireless headphone list, regardless of price. You get some dynamic features like voice activation, NFC, noise-cancellation and more. If you need more than just a wireless pair of headphones, you can always check our best noise-canceling headphones or best wireless headphones to use with your TV here as well.